Pokemon Part 1 | Tourmaline . 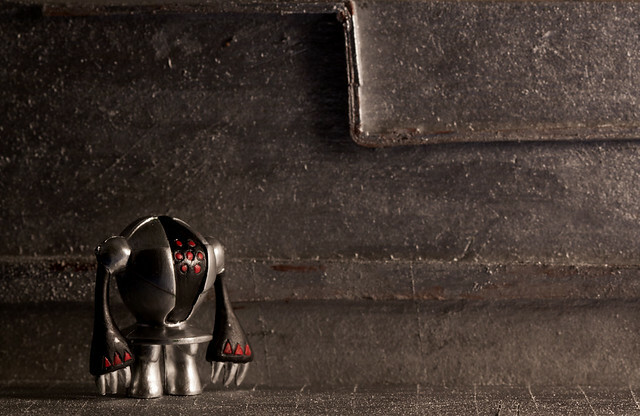 2 cm tall Pokemon figures painted and posed in their “natural” environments. As I discuss here, I recently ordered some small pokemon figurines on ebay with this series in mind. They didn’t arrive quite in the quality I expected so I’ve been working on repainting all the usable ones. Below are the first 10 miniature diorama photographs I’ve completed with these guys and a bit of info on how I created each scene. 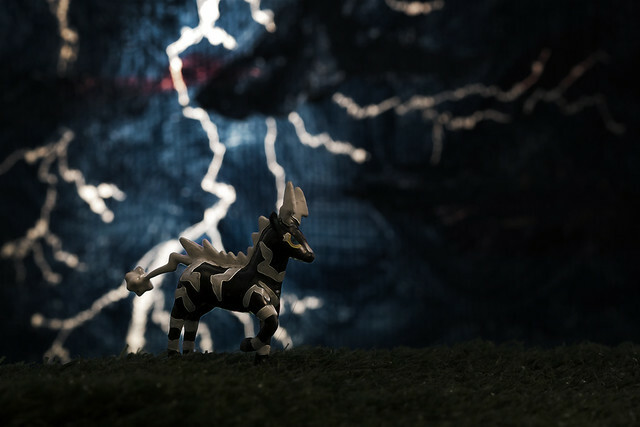 Zebstrika against an acrylic painted sky. 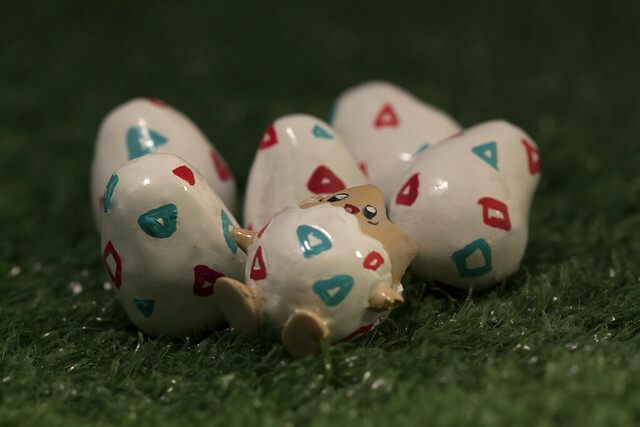 Togepi with a group of matching polymer clay eggs. Sebleye in a mystic environment made of cellophane. Registeel in a metallic factory of sorts made of cardboard. 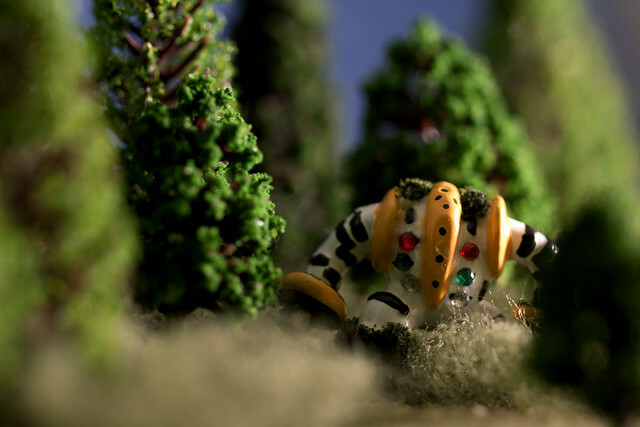 Regigigas becoming one with the forest (model scenery trees). 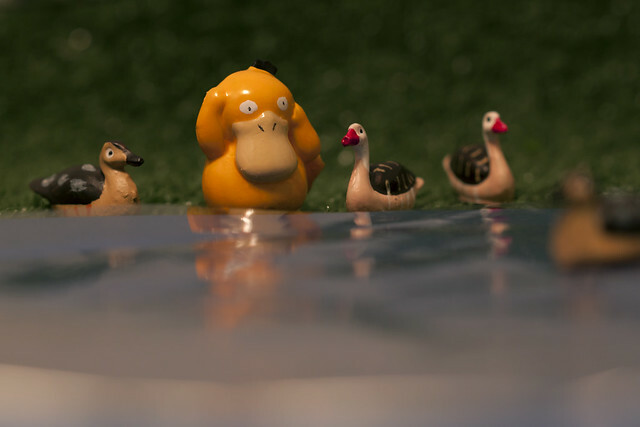 Psyduck and friends (dollhouse scale ducks) by the lake (cellophane and paper). 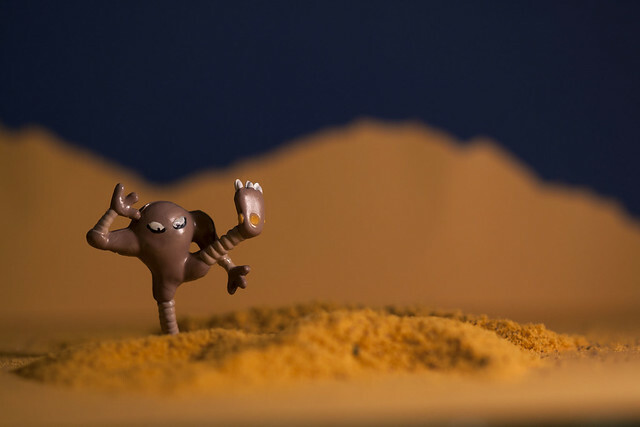 Hitmonlee in the desert (paper and model scenery yellow grass). 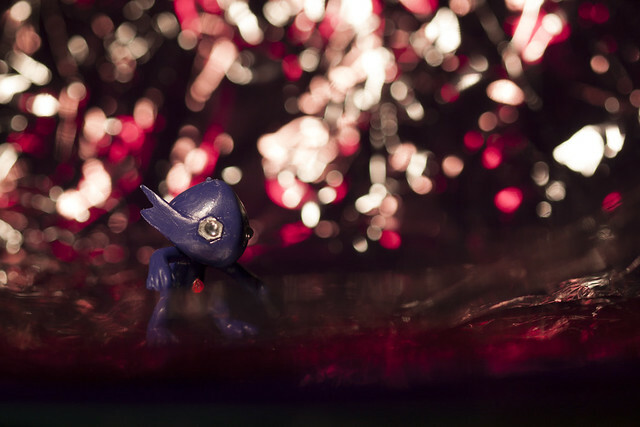 Gyrados after a child (cellophane, reflective scrapbook paper and n scale child). 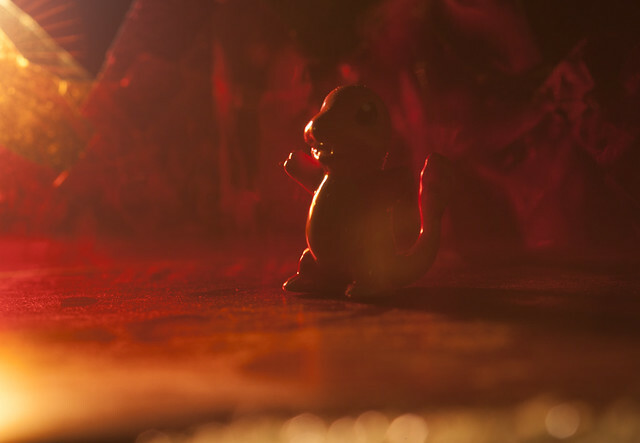 Charmander and fire (cellophane with a dollhouse wooden floor as a slightly reflective surface). 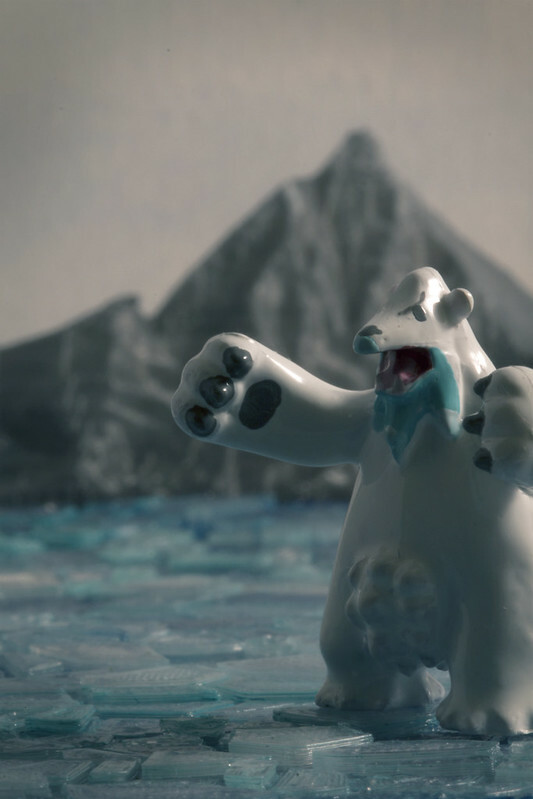 Beartic on ice (3d designed & printed ice, 3d printed mountain – painted with enamel paint). Pokémon is a media franchise managed by The Pokémon Company, a consortium between Nintendo, Game Freak, and Creatures. These companies and their affiliates do not sponsor, authorize or endorse this site. Follow me on instagram @jennifernicholewells to see in progress repaints and final images as they’re completed. Drop me a line below to let me know what you think, ask a question or tell me what your experience with Pokemon has been. wow. This is an amazing series. Do you have a 3-d printer? Thank you!! And yes I have an m3d. Still learning the ropes 3D design wise but I’ve got the simpler stuff down. Love all the pokemon!! You did a great job!!! I play Pokemon Go! and psyduck is my favorite! I love his sound. Very cool. I love the variety of worlds. I am not keen on Pokemons – perhaps I am too old – but I love your small ones, especially because they are so tiny! Thank you. To each their own. I think it’s one of those things that can span all ages but it still has to draw you in. For me right now it’s more of a nostalgia thing than anything else. I never watched the show growing up. Wasn’t my thing. But I liked the creatures and the collecting and I think just being a part of the craze. On a stretch of the run (a cross country paper chase style run) I was on my own when I happen to come across a family on a camping site near the river. I jogged past when the father pointed his mobile phone towards me and shouted: “Look kids, I’ve got a pokemon! !” :-D — But I must say I like your miniature real live versions a lot better than the virtual ones! Have you got a jiggly puff (they said I looked like it but my singing still needed improvement)? Love the costume! I haven’t been playing Pokémon go as much as when it first came out but it actually made me more social and encouraged me to get out and about. Yes everyone’s looking at their phones but I’d venture to say that even without Pokémon go they still would be. Lol no jigglypuff. Although I’d love to do a picture with one if I did have one. I’m sure you’re singing is wonderful :P Do your sons play Pokémon go now? No, they don’t. It probably depends if the friends are playing or not. At the moment, they are far too busy with other things. – You might be right about people only looking at their phones. I was in a tram yesterday and except for a couple of oldies (my age — hehe) everybody was doing something with their phones. I used to read on longer drives but now I too, check messages etc. on my phone. But it does look zombie-like if one watches.